Welcome to another Food Matters Monday! I’m excited to be hosting this week and excited to see what everyone else comes up with. I’ve included the original recipe below–for variations on the recipe, head on over to the Food Matters Project site and look through the comments. To see visuals of all of the oatmeal griddle cake recipes, head on over to Pinterest for some eye candy! I had a roommate that ate oatmeal every morning for breakfast and I always made fun of her. “What are you, 80?” Fast forward 3 years…I eat oatmeal almost every morning. Who’s laughing now, right? It never ceases to amaze me that I never get sick of oatmeal. But truth be told, my oatmeal is often not the same from day to day. One day I may have oat bran with dates and walnuts, the next, baked oats with blueberries and almonds, the next, steel cut oats with apricots and coconut. 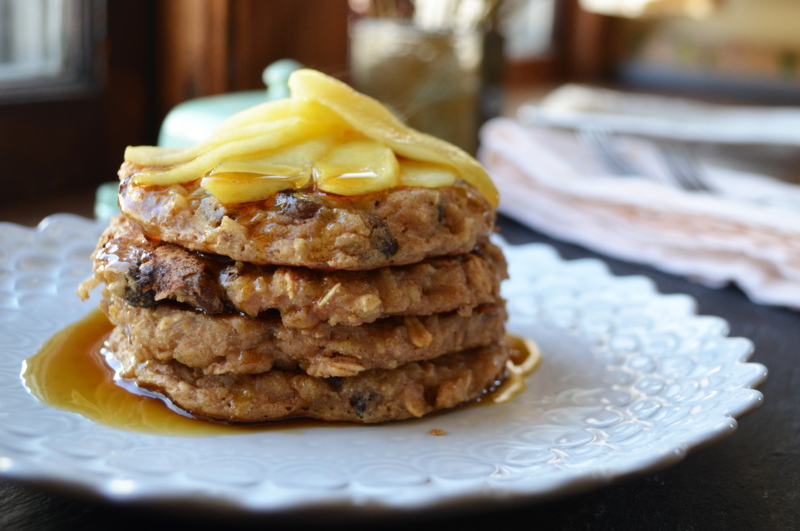 Thanks to the Food Matters Project, I now have yet another way to get my oats fix: oatmeal griddle cakes. These griddle cakes easy to make and reminded me a bit of spaghetti pancakes in that I was able to take leftovers and reinvent them into something soft on the inside, crispy on the outside (if you’ve never tried spaghetti pancakes, I encourage you to try–take cold leftover spaghetti with marinara and fry it in a pan with some olive oil until crispy on the bottom. Flip over and cook until crispy on the other side. Ahhh…..college memories are flooding back). The griddle cakes are quite unlike what I would have expected before making the recipe. Rather than turning out cakey like pancakes, they were soft and slightly sweet oatmealy goodness on the inside and crispy on the outside. 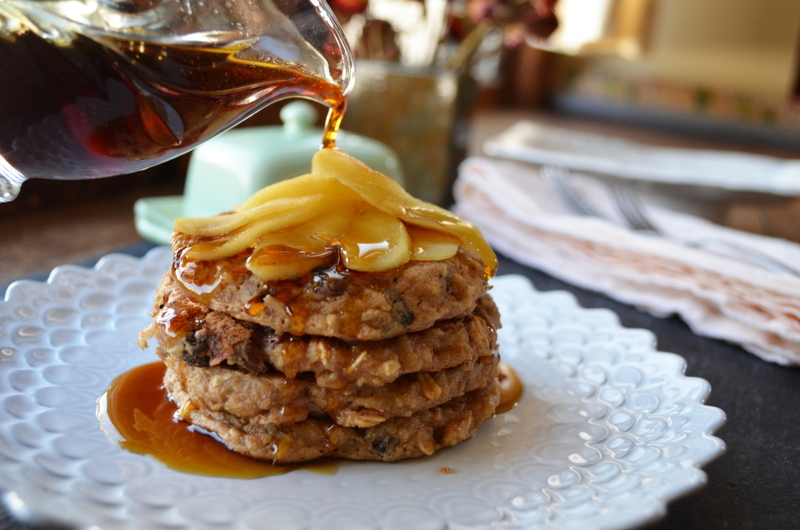 Served with butter and a blend of molasses and maple syrup, these made for a healthier alternative to pancakes…but still allowed me to get my fix. Heat the oven to 200° F. Combine the flours, oats, baking powder, cinnamon, and salt in a large bowl. In a separate bowl, whisk together the egg and milk; stir in the cooked oatmeal and raisins until just incorporated. Add the oatmeal mixture to the flour mixture and stir gently; don’t overmix. The mixture should be the consistency of thick pancake batter; if not, add either a little more milk or whole wheat flour as needed. Put a large skillet or griddle over medium heat. When a few drops of water dance on its surface, add a thin film of vegetable oil and let it get hot. Working in batches, spoon the batter onto the griddle or skillet, making any size pancakes you like. Cook until bubbles form on the top and pop, 2 to 3 minutes; you may have to rotate the cakes to cook them evenly, depending on your heat source and pan. Carefully flip the griddle cakes and cook until they’re browned on the other side, a couple of minutes more. As they finish, transfer them to the oven while you cook the remaining batter. 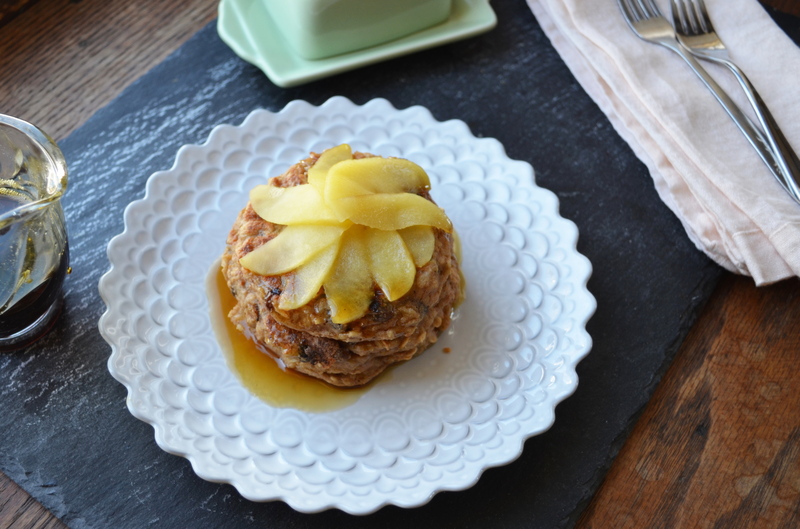 Serve drizzled with molasses or maple syrup and topped with cooked apples if you like. What a great alternative to regular old oats! Can’t wait to try! Do you know if it makes a difference whether the cooked oats are steel cut or rolled? I’m thinking steel cut would yield a denser cake. I think steel cut would work fine! Maybe a little more dense but I think it would be chewy and nice. Let me know if you try it with steel cut! I’ve only tried it with steel-cut and it is really great! Lexi, have you guys cooked migas breakfast tacos? They are my favorite breakfast, after oatmeal. I am going to post the recipe soon!